HARD HITTING DETROIT LIONS FORUM - View topic - coaching staff hiding scheme in regular season? coaching staff hiding scheme in regular season? Do you think they have been playing that way this season to get to the playoffs so there's not any film on it? It's crazy to think that could be the case, but don't forget the goal for the team is to win the SB. Playing this way would give us a monsterous advantage in the playoffs. And when you have Stafford and our DL, theoretically you would be able to do that and still make the playoffs. It awaits to be seen. I'm willing to bet we see some drastic scheme changes vs the Saints. Re: coaching staff hiding scheme in regular season? I have felt, quite often this season, that we have been rope a doping other teams. I really dont think so. "lack of aggressiveness" - stafford just went for 5000 yds and 41 tds with nearly 1700 yards to one player alone. as for mixing it up - the lions have spread the ball to many different offensive weapons out of several difft formations. we ve run the ball with 5 difft running backs all of difft skill sets plus end arounds and reverses to the wrs and even designed run plays to the kick returner. we ve used 2 te s, 3 wr s w a te, te split wide, running backs lined up as receivers. I think Linehan has been quite creative all season long and in the last few weeks he s mixed in the creativity with the aggressiveness of getting it to Calvin. I supposed they may have a trick play or two we havent seen yet or a fake on special teams but for the most part I think the playbook doesnt have many hidden secrets that will suddenly change in this playoff game. as for the defense cunningham tends to avoid blitzing but in games where things have gone bad he will dial them up, anything to get pressure. I think the one thing that they dont do as much as they did earlier in the year is moving suh around on the dline, i particularly liked it when they had suh in the "joker" role moving around and picking and choosing his gap. in any event, when you are missing key players like delmas and berry the tendency is to use more zone and less man coverage, it doesnt help that houston and wright have been either injured inconsistent or both. Thinking of what else they could do different - I think Suh in the joker, more of Fairley lined up head up on the center where he is very disruptive, and disguising the coverages which they rarely do. When a team has a freak at TE like Graham or Finley I wouldnt mind seeing one of the DEs ie Avril or Young who matches up athletically cover them, it is a total mismatch if they end up with Spievey or one of the other DBs. They should also limit how often they send Durant and Levy on blitzes. Levy bc he is a poor blitzer and Durant is a good all around base defense player who reads the play very quickly and doesnt gain much by blitzing. Tulloch I think gets an edge when he s blitzed but otherwise I would show a lot of blitz but not recommend blitzing more than 20% of the plays. In summary - I d say the offense has pretty much shown everything. The D could go to more of a couple of fronts where the DL is moving or has someone as a true NT and disguise coverages. I agree mostly about the offense. But you know how in the beginning of the season we started out slow and "opened things up" as the game went on? This could be why. Later on in the season, too, it seemed our notorious sluggish starts were no longer there and we came out firing. That could very well signify us trying to "hide our scheme" just to find out that it is unsuccessful, thus leading to us opening up the playbook. On O I don't think we have a lot to show, it seems the past few games we have done better as a whole coming out firing and sustaining that energy throughout the game. Hopefully we can continue that trend into the postseason. I don't know if anyone else agrees, but the best game that I saw from this team was PS game 3 against Brady. It was #1's on #1's and he couldn't get comfortable, and we wound up dominating them. I haven't seen a single game that has reminded me of that one. SF, CHI, SD, and GB #2 were close, but not quite as Defensively Dominant. Suh has been disappointing this year, possibly because teams scheme for him now, but we just have not given QB pressure quite like we did in PS Game 3 and I don't know why! I don't believe for a second that coaches have held out. That said, I wanted to add one thing to your comments here regarding QB pressure by Detroit's D. I agree that it seems like they've gotten less pressure than last year, but they actually only had 3 more sacks last year (41 this year, 44 last year). I was pretty surprised when I saw that. Coaching staffs don't hold back anything during the regular season with the expectation they will make the playoffs. Making the playoffs was never a given for this team, even after the 5-0 start. Linehan has run the offense the same way he's done since he's been here. With Stafford healthy, he's able to call up more vertical routes, but otherwise everything else is the same. With the Lions having effectively no running game, the offense is one dimensional and limited in that scope. On defense, while Cunningham has been known as blitz happy in his coaching career, it's not what he and Schwartz want to do. They both prefer to pressure the QB by using the front four, and forcing the turnover or mistake that way. One thing that the Lions SHOULD be doing is using Bobby Carpenter on passing downs more often. He can blitz and cover better than Levy or Durant. While he wouldn't be able to cover Jimmy Graham one on one, the combination of Carpenter and Spievey on Graham would be pretty good, I think. 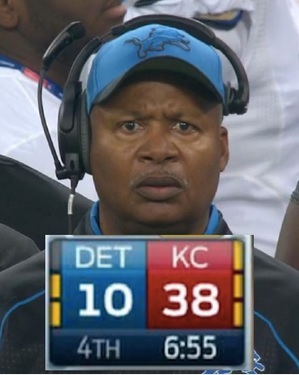 The Lions haven't held back anything. It wouldn't surprise me to see some surprise offensive plays against New Orleans, but they would be added for this game, not with held until we got to this game. It would be the epitome of idiocy to be 'holding back' anything when you're the 6th seed. For the record, I don't believe they held anything back, but I do believe I haven't seen this team truly fire on all cylinders, on both sides of the ball, like I did in PS Game 3. I remember being so amazed at what I was seeing, and it gave me such hope for the future, and then to watch us start 5-0, I had a kool aid I.V. drip going. But as the season has worn on, I haven't seen put it together like we did, and that could be due to injuries, and penalties. I really hope we get it together, and if nothing else, don't EMBARRASS ourselves by a crap load of penalties, and a blow out. I hope for a win, but if we lose let it be by as few points as possible to allow us to leave with respect and not the shame of the dirtiest team in the NFL. Calvin is Always open 4 feet over the defenders heads. It don't matter if they are triple covering him.